When the word 'poetry' emerges in conversation, most people immediately refer to whatever they were exposed to in secondary school. The usual suspects come to mind: Shakespeare, Edgar Allen Poe, Langston Hughes, Maya Angelou — the list goes on. When it comes to performance poetry, well that’s a different story. There was a time when the term was unheard of, unless you knew whose basement to be in at a particular time, on a night not explicitly pronounced. Slowly but surely, the act of reading poems aloud in front of people started picking up speed and transitioned from basements to center stage. Poets went from spitting in basements to reciting in the streets, bars, cafes, on Broadway, on TV, in films and now on the internet. Granted, I’ve bypassed a lot of the history, important names and locations that are attached to this art form only to get to this particular point in time. Performance poetry was once something that was confined to a mere few in secret, and is now accessible to everyone via the internet — and it's going viral! 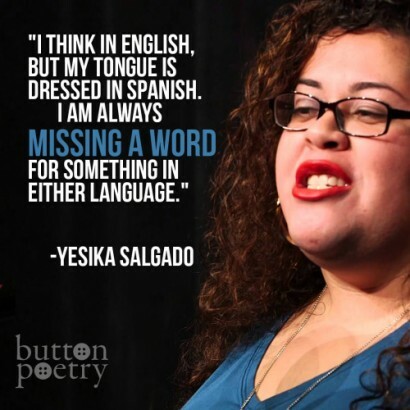 Just ask the folks at Button Poetry. YouTube houses many of these performances. There are a plethora of channels that are dedicated to providing the highest quality videos of your favorite spoken word poems, and they do a darn good job of it. But there is one brand in particular that has recently been the number-one provider of these videos and has become somewhat synonymous with the idea of performance poetry. Fellow poet and the Assistant Director of Button Poetry, Dylan Garity, speaks with Blavity's Creative Society about reaching millions of viewers, HBO Def Jam Poetry comparisons and upcoming projects. Photo: Tumblr Blavity: Some of our readers might not be familiar with Button so if you could, would you mind telling us what Button Poetry is, who’s part of it, and what the goal is for the company? Dylan Garity: Button Poetry is a multimedia poetry production and distribution organization based out of Minneapolis/Saint Paul, Minnesota. 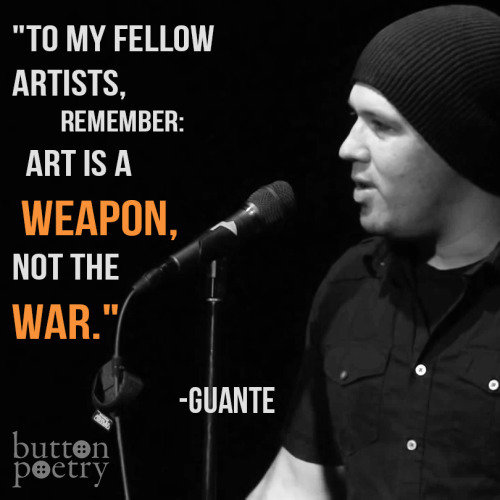 To steal from our mission statement, our goal is to showcase the power and diversity of voices in performance poetry. By broadcasting the best and brightest performance poets of today, we hope to broaden poetry’s audience, to expand its reach and develop a greater level of cultural appreciation for the art form. Sam Cook is the Executive Director of Button Poetry, and I’m the Assistant Director. About 10-20 other folks work with us on a relatively regular basis, filming around the country, editing, working on our website, managing social media, working with our books and our book contest, etc. B: Congratulations on all the success. Button hasn’t been around that long and you’ve managed to gather a very large and dedicated fan base. Did you ever think it would get this big this fast? DG: We always believed in the potential for poetry videos — and performance poetry in general — to have bigger, more consistent audiences, but it definitely happened faster and to a greater degree than we expected. Button officially was founded in 2011, and at the time our primary goal was to host audio-recording parties and accept audio submissions, and make collaborative poetry albums that poets from around the Midwest could go and share at their own venues (Here’s a link to the unlisted first-ever video on Button, which was a call for those submissions). So relatively small potatoes, though a project that I still think was really cool. B: It seems like Button Poetry videos are making a habit of going viral. Do you remember the first poem on the channel that went viral? What was that like for the company? DG: The first thing to go “viral” was Denice Frohman’s “Dear Straight People,” filmed at the 2013 Women of the World Poetry Slam. It happened about a month after the video went up, and I remember standing around a screen with Sam and some other folks just watching the view count shoot up exponentially, marveling at it and immediately talking about what it might mean for videos in the future. It was the first tangible proof for us of what we’d always believed might be possible, though again, we had no idea how far it would go. Photo: Tumblr B: A lot of the footage you capture is from national poetry slam competitions. At these competitions there are hundreds and hundreds of poets from all over the world, reciting some of the most important, breathtaking pieces of work anyone has ever heard. How on earth do you pick which poems do and do not get posted? I know it has to be difficult. DG: At this point, we try to get as many people involved in the process as possible. An important philosophy for us is that showcasing diversity isn’t just about who and what is on the screen, but who and what’s behind the screen, in both the creation and curation processes. Now that we tend to film most if not all poems when we’re at the big national tournaments, which can easily be hundreds of pieces in just a few days, we often end up posting only about 10% of what we get on camera. We pare down that original footage in a number of steps, so no one person or group of people are having to consider all of those hundreds at once. B: A lot of times in music there’s a backlash from the go-hard musicians and fans when the underground scene starts to go mainstream. There’s a sense of culture and integrity they feel has been desecrated when certain songs or artists hit the radio, for example. The same can be said about poetry. It was something that was a very underground, unique experience that was meant to be heard live, and now anyone can watch it if they are near a screen. What are your thoughts on performance poetry being so accessible now and what that does for the culture? DG: I think there are definitely positives and negatives to it. The biggest potential negative I see is a potential homogenization of writing style among young people; while we have wildly varying styles of writing and performance on the channel, a lot of the stuff that goes the most viral has some strong similarities, and I hope that young or new writers who are watching our videos take the time to watch and read more than just the ones at the 'top.' 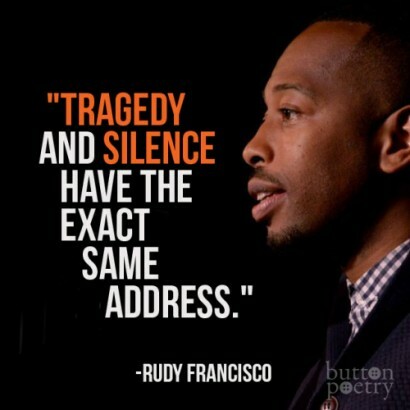 At the same time, we’re really starting to see, and not just because of Button, poetry and performance poetry filter into popular culture in some pretty unprecedented ways. Poets collaborating with major musicians, being featured on The Late Show and PBS, on Buzzfeed and dozens of other internet platforms. At the end of the day, the positive of this kind of beautiful and necessary work reaching tens and hundreds of millions of people who it couldn’t have before outweighs everything else. 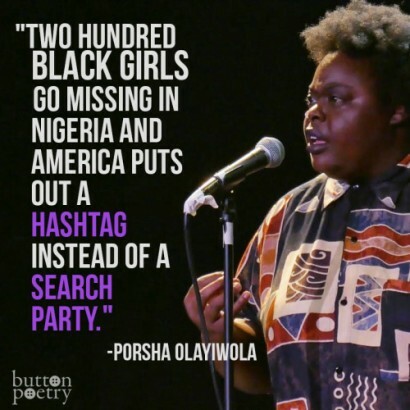 Photo: Tumblr B: The exposure you provide for performance poetry is at such a grand scale some people I know say Button is this generation's HBO Def Jam Poetry. Would you take that as a compliment or would you rather be put in a different lane? DG: I would absolutely take that as a compliment. 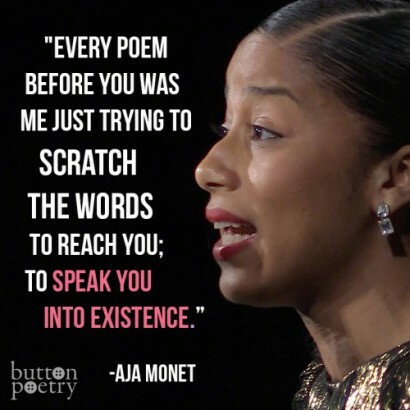 Many of us who work with Button came up watching Def Poetry on HBO, and it so heavily influenced and continues to influence a whole generation of poets whose work might not exist without it. I don’t think we do the exact same thing — one major difference being that we’re an artist-run organization broadcasting other artists. I hope that we’ll continue to expand and reach more and more people, but hearing that comparison is truly exciting and flattering, and I hope we can live up to it. B: You guys don’t just record poems. You’re publishing books now, too! What else are you up to? Any upcoming projects we should know about? DG: Actually, we’ve been publishing books almost as long as we’ve been doing video! We ran our first chapbook contest in the summer of 2012, which led to our first book, Aziza Barnes’s brilliant me Aunt Jemima and the nailgun. We have forthcoming books from Jacqui Germain and Hanif Abdurraqib — and some more to be announced soon. The rest of our current library can be found here. In terms of other projects, we’re working on expanding more heavily into audio this year, and also will soon be offering a subscription service with deals and additional content beyond just what’s on the Button channel. Follow us on social media or our mailing list to keep up to date about all of that. Photo: Tumblr B: Between you and I — and you can tell me because we’re cool — what's your favorite poem? DG: I’m gonna cheat and not choose anything from Button. The poem that’s struck me more than any other over the last couple years is Ross Gay’s “A Small Needful Fact.” It’s so powerful, so concise yet lyrical, vital and timely, yet also timeless. B: What can people who love Button do to help you keep doing what you do? DG: Watch and share videos. Attend poetry shows. Read books. Write and encourage young writers and help make poetry and performance poetry basic parts of American — and international — culture, just things that average people read and watch and listen to and experience every day. In terms of the organization more directly, we’d encourage folks to check out the books from our amazing authors at the Button Store, and as mentioned earlier, we’re launching a subscription service soon so folks can offer direct support to Button long-term and access additional content and deals. B: Do have any advice for those who are starting out with their own projects that they want to build into something great? DG: It’s gonna be tough. We’ve worked really hard and also gotten really lucky at points, and it’s still really tough. Form a clear idea of what you want to do and make concrete plans for how to get there — advice I would give to our past selves a hundred times over — but also don’t get too bogged down in the details from the start or you’ll never get moving. As evidenced by what I’ve said about how we started, your initial project might morph into something entirely different than what you conceived of, and that can be a beautiful thing. We know what Dylan's favorite poem is, now let us know what poem you're really feeling right now. Leave a comment or let us know on Facebook or Twitter! Savon Bartley is an international spoken word poet, award winning writer, teaching artist, and storyteller.